BRH vs MLS, 42nd Match, Big Bash League 2018-19. 🏟️ Melbourne Cricket Ground, Melbourne. BRH announced 13-men squad for the match. Matt Renshaw returns to the squad replacing Sam Heazlett. MLS declared 13-men squad for the match with one change. Dan Worrall replaces Lance Morris in the squad. Chris Lynn (c), Max Bryant, Ben Cutting, Brendan Doggett, Josh Lalor, Brendon McCullum, James Peirson (wk), Mitchell Swepson, Mujeeb Ur Rahman, Alex Ross, M Kuhnemann, Jack Prestwidge, Matt Renshaw. 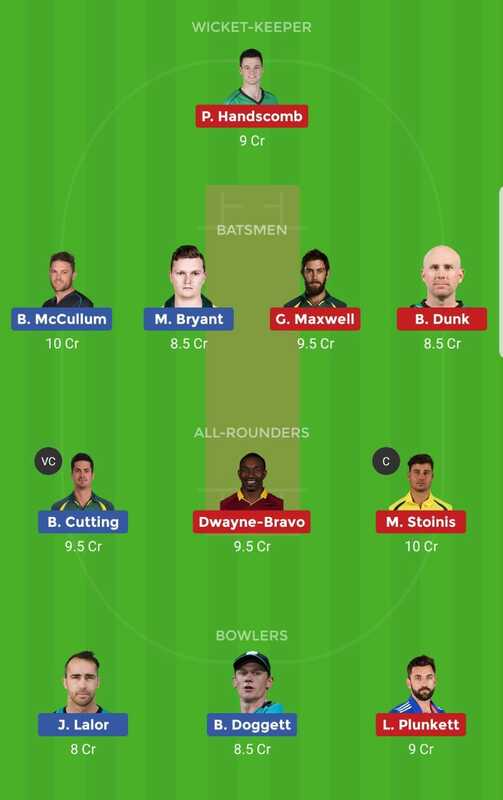 Max Bryant, Brendon McCullum, Chris Lynn (c), Matt Renshaw/Jack Prestwidge, James Peirson (wk), Alex Ross, Ben Cutting, B Doggett, Josh Lalor, Mitchell Swepson/M Kuhnemann, Mujeeb Ur Rahman. Marcus Stoinis, Ben Dunk, Peter Handscomb (wk), Glenn Maxwell (c), Nic Maddinson, Dwayne Bravo, Evan Gulbis, Liam Plunkett, Adam Zampa, Jackson Bird, Tom O’Connell/Dan Worrall. Watch Video Team for Details on each player.